Pursuing a career as a nurse is not an easy feat. There are steps that you have to accomplish first before attaining a nursing position. The primary step in becoming a nurse is to take a nursing licensure exam. 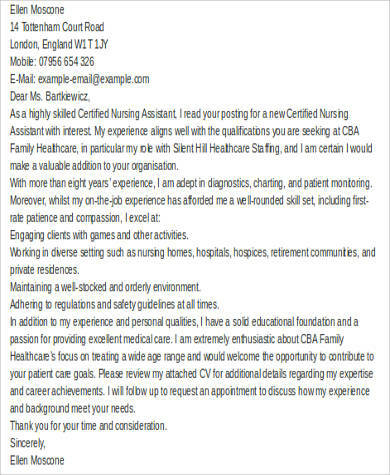 Once you have passed the exam and have been duly registered as a nurse, then the next obstacle or, rather, challenge, would be applying for a nursing position at hospitals, clinics, and other medical facilities. With the massive number of nursing graduates yearly, the competition is tough in getting a nursing position, especially at prestigious hospitals and clinics. That is why it has become necessary to include a well-drafted cover letter together with the resume during the application process. 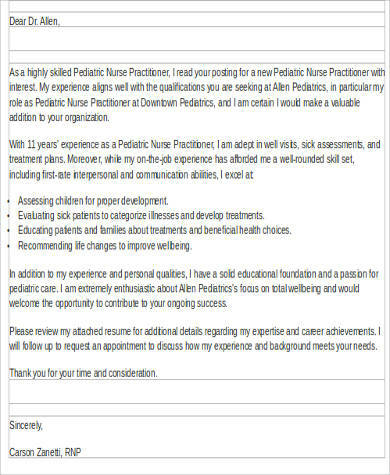 If you are a newly-registered nurse or an experienced one who is looking to apply, then you can benefit from our freely downloadable and easy-to-access nurse Sample Cover Letters. Scroll down below and select the samples that you deem useful. 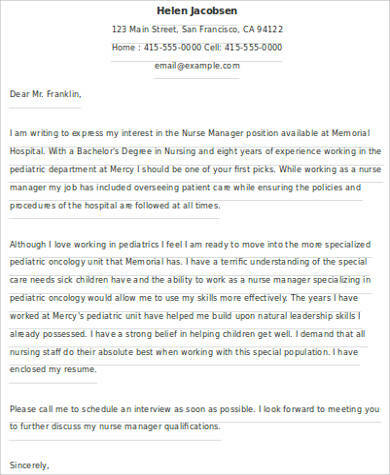 You can pattern your cover letter from our samples or if you wish, you can simply edit any of our templates by adding your specifics. A cover letter is important because during the application process, a recruiter would scan the primary documents sent by an applicant such as the resume or CV, the cover letter, and the recommendation letter. These documents serve as the foot-in-the-door technique that helps any applicant get a slot for an initial interview. 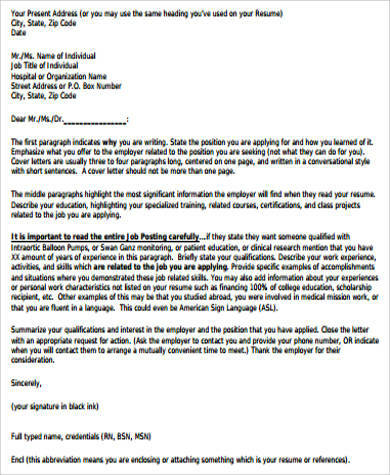 The cover letter, specifically, is the most effective tool for increasing one’s eligibility for the job. The reason for this is because, unlike a resume that gives little to no room for creativity and elaboration, a cover letter allows you to include the more emotive and values-based aspects of your personality that will surely attract the interest of any recruiter. 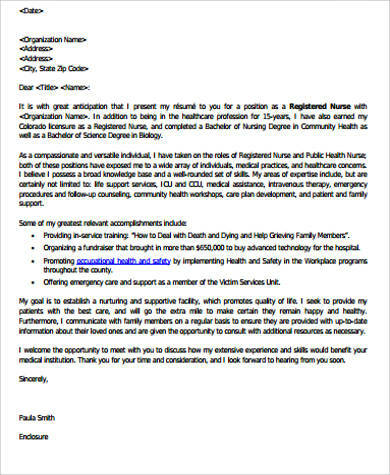 In the cover letter, you can write how nursing has become your passion and helping other people is a job that you find meaningful. Additionally, you can also elaborate more on your positive attributes by narrating experiences, which suggest the credibility or factuality of your positive attributes. 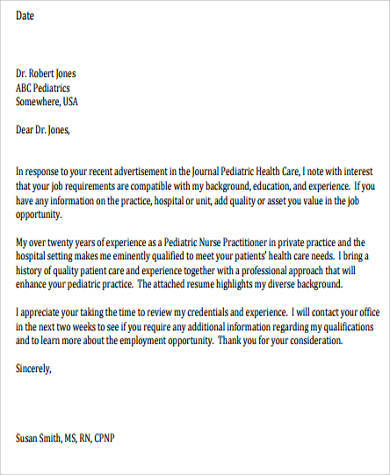 Indeed, a cover letter is vital for any job application. 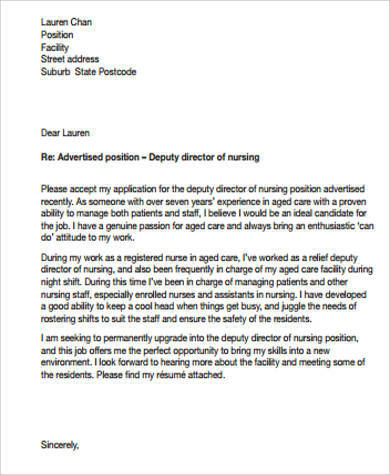 If you want more reference for your cover letter-writing, you can check out our collections of Examples of Cover Letter and Sample Nurse Cover Letters that are also available for free download. Simply click on the links provided. Now that you know the basics, go ahead and write your cover letter! 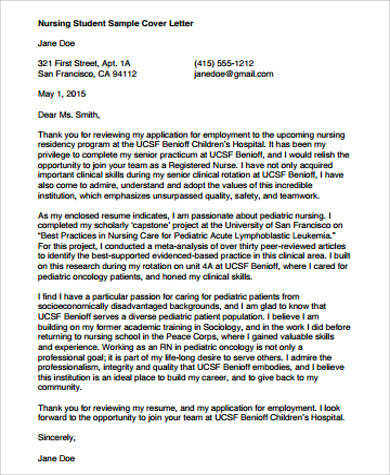 For future reference, our Cover Letter Examples for Students might also be of use to you.